Are you ready to own or operate your own business? Want to take steps to grow your current business? Find help for both paths by taking the Door County Small Business and Entrepreneurial Training Course this winter. Weekly classes begin Monday, January 28 at the DC Economic Development Corporation’s Business Development Center. This eight-week business planning course will guide you through a step-by-step approach to researching and writing a professional business plan. * Identify opportunities and market your business …Will your brilliant idea make money? * Write a detailed, comprehensive business plan…Get ready to make your dream a reality! The course is open to those who are considering starting their own business, existing small businesses wanting help to get a handle on all the details, or successful businesses looking to grow. 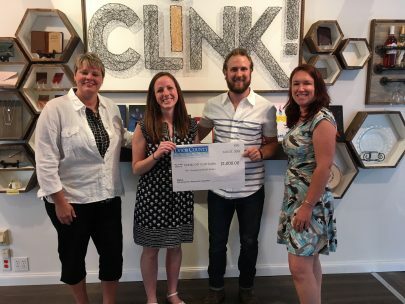 2016 Business Plan Contest winner of $1,000 cash – Angela Lensch Jewelry! Pictured: Sam Perlman (former DCEDC Economic Development Manager) and Angela Lensch. Recent data from the SBDC showed that from 2004 to 2018, the Door County program has had 123 participants, 56 of whom went on to start a business. The cost for the Door County Entrepreneurial Training Program is $250, which includes books and materials. The course usually costs $1,000, however the Wisconsin Economic Development Corporation is offering an Entrepreneurial Training Grant to qualified applicants (must submit a passing, completed business plan) that covers 75% of the tuition. The Door County Economic Development Corporation (DCEDC) and the Wisconsin Small Business Development Center (SBDC) at UW-Green Bay are proud to once again sponsor this entrepreneurial training program in Door County. CLICK HERE TO REGISTER by Friday, January 18, 2019.